Cadle Edwards delighted the audience with her poem about “Growing More than Old” through participating in meaningful life activities connected to the quality of growing up of the next generation. On April 18th, The Arts at Center Street hosted a night of poetry called “Odes & Odysseys.” Fifty people were in attendance, and almost a dozen people shared poems and spoken word, the majority of which were original works. It was an impactful evening as people disclosed their thoughts through the powerful medium of poetry. The night began with an open mic, during which ten people participated. One young woman described her journey from the heavy burdens she silently carried growing up in a broken home, to the voice she has today. A mother of two and elementary school teacher cleverly questioned whether she is “growing more than old,” concluding that indeed she is, as she is growing the young minds of her children and students. A father of a young boy with disabilities beautifully depicted his wife’s unrelenting efforts to help their son. It was a very special time for the poets and their listeners. 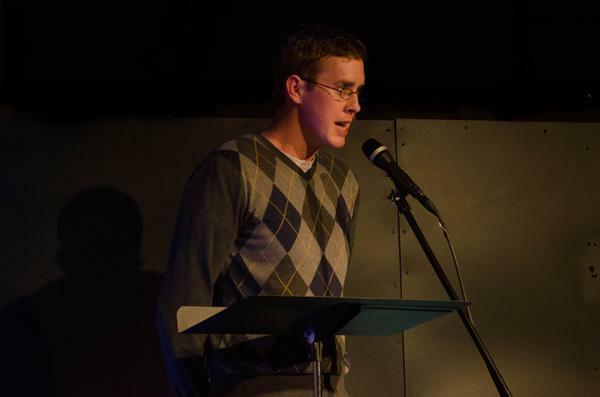 Reese took the stage for over a half hour as he offered, not only his poems, but also pieces of himself. His use of inflection and expression to stimulate his speech turned what were simply words into an inspiring performance. The night ended with a handful of original poems from Ben Reese. Reese, age 27, is a local poet who began writing poems as a college student in Chicago. He has composed hundreds of poems, none of which he says he has ever written down. The ones he recites he simply knows by heart. Reese spoke on the strength of women who, even in the midst of suffering, will faithfully set a table of food for their children. In another poem he highlighted the power of the city to overshadow the natural beauty of creation, and the elderly who still notice it. His concluding “ode” detailed his own “odyssey” as one who once thought life would be better lived alone, to someone who can now look into the eyes of another person and know that without them, there is no laughter, no joy, no song. When asked why he writes poetry, Reese replied, “I write poetry because I want to use language in surprising, inventive, and meaningful ways. I want to speak something that doesn’t just communicate facts, but moves, challenges, and awakens the listener.” I think I speak for everyone in attendance that night, that Reese did just that. What makes poetry so powerful? Poetry is pedagogy in art form. It is a lyrical presentation of knowledge which, given any other way, would not strike its hearers so profoundly. It has the power to bring smiles and laughter, or cries and heartache, all in a single recitation. It predates literacy; before their were readers, there were poets. It is carefully crafted storytelling. Brett Madron surprised his wife with a moving poem about her relationship with their son. The biblical writers knew the power of poetry to educate, inspire, and tell the truth. Almost every book in the Scriptures includes poetry. From the psalms, to the words of the prophets, to Mary’s song, poetry helps explain to man the heart of God. Poetry knows no borders. It crosses cultures, genders, and generations. It can be used and shared by both the literate and illiterate. It is a medium that powerful history writers cannot commandeer, for whoever can speak an honest word can tell a poem. It was in this spirit that the night of poetry was enjoyed, and, considering such, it was quite a success.